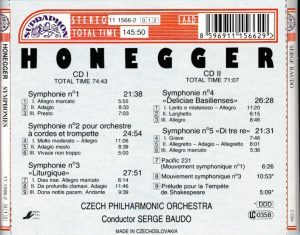 Serge Baudo’s complete traversal of Honegger’s Symphonies with the Czech Philharmonic Orchestra for Supraphon was an important landmark in the LP era, and first of all because it was the first one. It received the universal accolades back then – but there was far less competition than today. When the cycle started being recorded, in 1960, there was only (excluding less than a handful of recordings from the 78rpm era) Munch in Symphonies No. 2 and 5 (RCA GD60685), Georges Tzpine in 3 and 4 (French EMI under the label Columbia, not reissued on CD), Ernest Bour in No. 2 (Ducretet-Thomson, not reissued) and a few others and today forgotten in 2 and 3 (Izler Solomon, Robert Hull, Walter Stoschek, Robert Denzler) and Markevitch in 5 (CD on DG “The Originals” 449 748-2 with Milhaud: Les Choéphores and Roussel: Bacchus et Ariane Suite No. 2) – and all in mono. 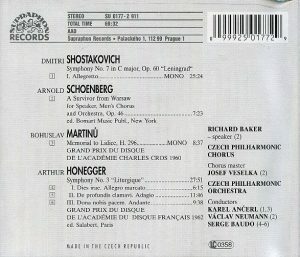 Baudo’s First Symphony may have been a recording premiere, even as late as 1973 when it was made: another version was published in the early months of 1974, by Michel Tabachnik and Orchestre National on the obscure French label Inédits de l’ORTF, never reissued on CD, and the exact recording date was not provided (and in a private correspondence, Tabachnik couldn’t remember exactly!). Anyway a lot of water has flown under the bridges since and many new versions have been recorded, including Karajan‘s famous versions of Symphonies 2 & 3 in 1969 (first CD edition 1988 DG “20th Century Classics” 423 242-2, reissue 1995 on “The Originals” 447 435-2), Munch‘s remake of 2 with Orchestre de Paris (EMI) and 4 with Orchestre National(Erato) both in 1967, Symphonies 2 to 4 by Ansermet and Orchestre de la Suisse Romande (1961 for Symph. No. 2 and 1968 for the two others), the complete traversals of Michel Plasson in 1977-79 (EMI) and Charles Dutoit in 1982 & 1985 (Erato) and everything that appeared in the CD era. Yet Baudo remains an entirely valid offering still today. As already hinted his cycle wasn’t recorded all at once but over a long span of time, first Symphonies 2 & 3 in 1960 (predating Karajan’s famous recording by more than a decade, since the latter, though recorded in 1969, was released by DG only in 1973), then Symphony No. 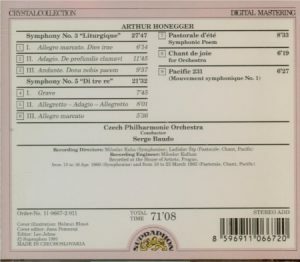 5 in 1963 (with Pacific 231, Pastorale d’été and Chant de Joie as complements), and with the two missing symphonies, No. 1 & 4, coming as belated additions from 1973. 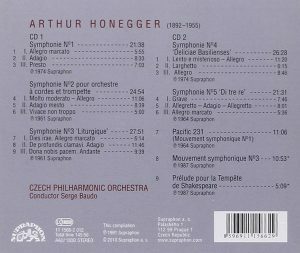 The two complements on Supraphon’s “Western” CD reissue, “Mouvement symphonique No. 3” and the Prelude to Shakespeare’s “The Tempest” are later recordings, from 1986. 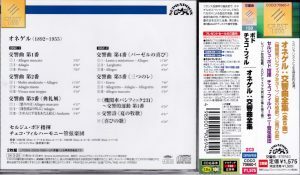 They originally served as complements to Baudo’s recording of “King David“, in its first, Japanese CD edition, Supraphon 60co-1412-13 (1987), barcode 4988001077534. Unexpectedly, the sonic quality on Supraphon’s Western edition doesn’t follow the chronology of recordings – in fact, it contradicts it. Baudo leads an excellent First Symphony, with a first movement that is suitably urgent, full of bite, aggressive and even nasty, but in these transfers the 1973 sonics are curiously distant and tubby, as if heard from miles away, and metallic, which hampers full enjoyment. It turns out that it is less a problem with the original pickup than with the transfer. The 2004 Japanese reissue offers perfectly fine sound – but see more about this vexed issue at the end of the review. The second movement would have been fine, but the all-important accompanying figure of trombone glissandi is barely audible. But the Finale is excellent and there the sonic shortcomings that had bothered me in the first two movements do not any more, maybe because the orchestration is centered more on brass and woodwinds than strings. Baudo’s Czech “blowers” play with great instrumental character, and their touch of crudeness is here perfectly in situation. On the other hand the 1960 sonics afforded to Symphony No. 2 are superb (and I don’t care the small measure of tape hiss), and Baudo offers, in the first movement, a great combination of the brooding and the biting. In fact I prefer his first movement to Karajan’s, Baudo is as brooding and he is more biting. Likewise his finale has great urgency and bite, and the trumpet is perfect, not as embedded in the violins’ texture as with Karajan (which is very legitimate and faithful to Honegger’s original intention, which was to sustain the first violins’ chorale melody so that it didn’t get covered by the polyphony of same-timbre strings) but not a vulgarly prominent as with many other versions. The minor disappointment here is Baudo’s second movement: it is eloquent but doesn’t have the intensity either of the more urgent Munch (both in Boston in 1953 in fine mono and Paris in 1967 in great stereo) or the more spacious and dirge-like Karajan: matter of surrounding sonics and orchestral body, but also of intensity with which the bows dig into the strings, and expressivity of the phrasings. With Baudo’s Czech Philharmonic the notes are played, with Munch and Karajan they are sung, even wept (with Munch) or moaned (with Karajan). Nonetheless, what is perceptible on direct comparison probably won’t heard on its own. In Symphony “Liturgique” (No. 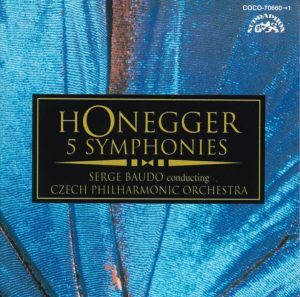 3), Baudo offers a furious first movement “Dies Irae”, ticking off a full minute over Honegger (a recording made in circa 1948 with an unnamed orchestra, see Music & Arts CD-767) or Munch (live with the Boston Symphony in Prague in 1956, a performance issued in 1990 on Multisonic 31 0025-2 and Munch’s only recorded testimony of that work) and almost as much over Karajan, a perfect realization of Honegger’s own description, “the day of wrath, the explosion of force and of hatred which destroys everything and leaves nothing but debris and ruins. The hurricane sweeps everything away, blindly and angrily. For the listener there is no time to breathe or think…“. The Czech Philharmonic, exposed by superb sonics, plays with tremendous vehemence and awesome virtuosity of every section. Despite Mravinsky live in 1965 with the Leningrad Philharmonic (with cruder and more brutal brass) and Järvi in 1992, only Jansons in 1993 equaled that degree of fury and breathlessness. 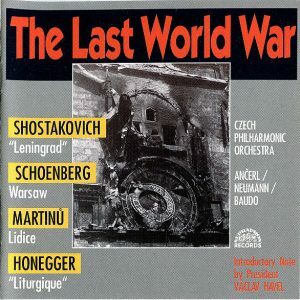 The Finale is excellent too, with fine instrumental character and potent brass, although just a touch short of the kind of 1,000-volt tension generated, through opposite musical means, by Mravinsky (urgent tempo, crude and brutal brass) and Karajan (very deliberate tempo – in fact the only stereo version to be spot on Honegger’s metronome indication – and massive dynamics). It’s a detail, but very typical that the drum (“caisse roulante”, the score calls it, e.g. the tenor drum) with its syncopated off-beats at 5:03 can barely be heard: when it is, it is a huge tension-generator, as the similar passages in Nielsen’s Fifth Symphony or Shostakovich’s 11th (but apparently, in all the versions where it DOES register, like Munch’s, Karajan’s or Mravinsky’s, a snare drum rather than a tenor drum is used). I find the long slow movement (“De profundis clamavi…”) problematic, but it isn’t Baudo’s fault. The composer himself said it had given him much trouble, trying as he was to develop a melodic line without using the customary methods and formulas, one that would “go forward without looking back“, extending “the initial curve without repetition or stops“. But where Mahler masterfully succeeded, especially in his 9th symphony (I am mentioning Mahler because looking at the way the music is laid down on the score, it looks very much like a Mahler orchestration), to my ears Honegger fails, because his material and moods sound naïve and tritely pastoral in the manner of the Christmas Cantata (“how hard it is to put a prayer without hope into human mouths“), making the movement seem (to my ears) overlong and diffuse. But I can’t fault Baudo with the way he conducts it (except for the Czech Philharmonic’s very nasal and reedy oboe), just a hair slower than the composer’s metronome indication, which is still more animated than how Honegger conducted it in his own recording (very pedestrian), with great clarity and transparency of instrumental textures, and building the climaxes to fine vehemence. That said, I find that more extreme approaches work even better: Karajan’s extreme spaciousness, which slowly unfolds the music like a calm and powerful river, or the dramatic urgency of Mravinsky and Munch (and the small cut exercised by the latter does no harm either). Baudo also offers a fine Fourth, with clear and detailed sonics that, in the first movement, lend great instrumental character to brass and woodwinds and, even more important, never let the woodwinds be covered by the strings and always let you follow the circulation of the melodies from one orchestral section to the other, and within each orchestral section. I like that Baudo takes a “lento” introduction to the first movement that is slightly more expansive than Honegger’s metronome and than the pacing of Munch and Ansermet, and hence more atmospheric, and establishes more of a contrast with the ensuing Allegro. There, I appreciate that Baudo, unlike Munch or Plasson, doesn’t take every excuse to slow down and play stop and go with the tempi (in particular at 4:08 when comes the second, lyrical theme played by flute, where Honegger indicates no tempo change), but maintains the forward flow and, with it, the cogency of the architecture. In truth, he doesn’t really observe Honegger’s subtle variations of tempo, with a basic Allegro and a slight relaxation of it at various points (for instance at 3:19), but it is always in favor of dynamism and sparkle. “Deliciae Basilienses”, the “Delights of Basel”, may be, especially in its first movement, one of Honegger’s most playful, gentle and pastoral works, but it is not a reason to let it go slack and mellow, on the contrary. Yet, if there was one small criticism to level at Baudo or rather his sound engineer, it is that everything sounds almost TOO exposed and big-sounding, as if trying to flaunt its effects. 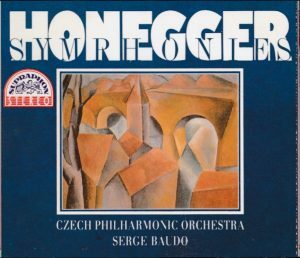 However, Baudo’s “Chinese Bells” passage at 5:56 (that’s how it sounds to me… maybe they are Basel Bells, but even the great Honegger critic Harry Halbreich likens the passage to “gamelans”) lacks a touch of brilliance perhaps. Following the lead of Munch (though not as extreme as the Alsatian conductor), Baudo takes the slow movement, “Larghetto”, at a tempo slower than Honegger’s metronome mark, highlighting its character of a Funeral March. But Baudo stands out for the bite of articulation he demands of his basses in the quasi-Passacaglia march motto that opens the movement and runs through it, and for the vehemence of his expression throughout. The theme of the pseudo folk song (by Franz Abt) “s’Basel an mim Rhy”, entoned by the horns at 4:35, could have stood out a little more. Again Baudo’s Finale benefits from the great sonics and the orchestra’s great instrumental character, with particularly glaring and incisive brass. The Fifth Symphony benefits again from great 1963 stereo sonics, a major and essential improvement over all the previous recordings, Munch in Boston (as good as were RCA’s sonics for their 1953 vintage) and Markevitch in 1957 (see links above), and an essential one in this composition, given the importance of the solo instruments in the orchestration. The only miss is the entry of the second trumpet at 3:26 with its tight repeated note rhythmic figure that opens the harmonic rise leading to the movement’s climax, almost inaudible (the first trumpet at 3:40 IS perfectly audible, as it should be). But it’s not just the sonics: Baudo also conducts a fine version, crisp and biting, similar to Munch’s 1953 pioneering recording with Boston in the first movement but more tight and taut than him in the second where Baudo is in fact very similar to the same Munch, but live with Orchestra National in 1964 (a recording originally published by Disques Montaigne MUN 2051 and reissued by Valois). The more leisurely and playful approach (also followed by Dutoit) certainly has its legitimacy and is possibly closer to what the composer had in mind, but it generates less excitement. Again Baudo leads a Finale of great urgency and excitement. 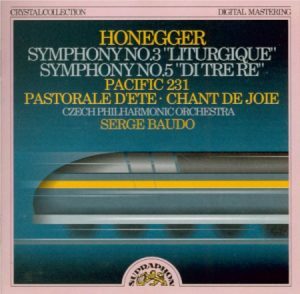 Pacific 231, recorded at the same sessions a the 5th Symphony back in 1963, is also an excellent version, quite unique among the competition from before or after in its bite and nastiness, less a locomotive slowly rolling up to (high) speed than a remake from Dukas’ Sorcerer’s Apprentice, and with sonics that allow for details to come through that are blurred in a dozen other versions that I’ve heard (and with even more impact if you can turn up the volume at a high level). Bernstein‘s 1962 recording has the edge, because of its even superior sonics and the touch of added drive of the conducting (paired with Milhaud: Les Choéphores and Roussel: Symphony No. 3 on Sony Masterworks Heritage MHK 62352 or on Bernstein Century: French Masterpieces, Sony SMK 60695), but Baudo’s remains one of the great recordings of the piece. Baudo’s Mouvement Symphonique No. 3 is the best of all modern recordings available on CD, the only one that can compete with the great versions of the 1950s, Furwängler live in 1952, Scherchen in 1954 (Westminster) and Tzipine in 1955 (the latter lamentably not reissued on CD). Like Furtwängler and Tzipine, Baudo takes a rather expansive view, on the opposite pole from the raging fury of Scherchen, but he fills it with gruff vigor. The presence, glare and relative crudeness of the brass is here much more in situation than the more comfortable sonics and tamed dramatic impact of the later and disappointing versions of Dutoit or Zinman. A pity Baudo never recorded Rugby, the “Mouvement Symphonique No. 2” (composed in 1928) which is the central piece of the triptych represented by Pacific 231 (“Mouvement symphonique No. 1”, 1923) and “Mouvement symphonique No. 3” (1932/3). But as much as I understand the interest of grouping together Baudo’s two remaining Mouvements, I don’t think it was a clever choice of Supraphon. It entails, for those who have the Japanese CD set with King David, an irksome duplication, with the additional cost of the loss of the two complements from the original Supraphon LPs, the two early symphonic poems Pastorale d’été and Chant de Joie. 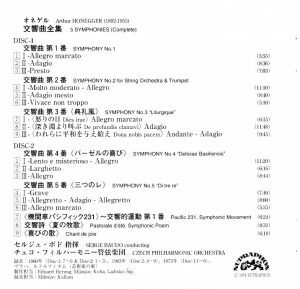 Supraphon finally reissued the missing Pastorale and Chant de Joie, either individually, as complements to Symphonies 3 & 5 (see heading) or in the Japanese reissue of the complete symphonies already mentioned above. But those like me who bought this original Western set aren’t likely to want to reinvest (I did!). Remains the download option, and the two bucks it costs won’t make a deep hole in anybody’s pocket, but unfortunately the option is not offered where I live. For newcomers however, the Japanese reissue would seem the best option. Things aren’t so simple alas. Other than offering Pastorale and Chant de Joie, it has considerably improved the sonics of the First Symphony, and that’s a huge plus. But, incomprehensibly, those for the other symphonies are not as clear, present and vivid as those of the earlier set. It is for the transfer of the Fourth Symphony that I find the situation totally incomprehensible. It was recorded in 1973, at the same session as Symphony No. 1 (although the Japanese edition wrongly claims 1960, and gives 1973 for Symphony No. 2, but looking at old Schwann catalogs confirms that this is wrong), so you’d think they’d be subjected to the same sonic treatment by the engineers responsible with the respective transfers. Yet I hear, in its transfer in the Western set, none of the sonic problems that affect the First Symphony. On the other hand, while the transfer of Symphony No. 1 on the Japanese set is a huge improvement over the earlier one, the one for Symphony No. 4 is a total miss: the level is very low, making it sound almost mono and causing it to lose most of its presence and impact. Sonic problems apart, Baudo’s interpretations aren’t enough anyway for the Honeggerite to break his piggy bank only for them. He conducts one of the most spacious Pastorale d’été I’ve heard (and I’ve heard many. The other spacious ones are, by decreasing order, Luisi’s, Plasson’s and Scherchen’s, and to a lesser extent Zinman’s and Lopez-Cobos’ – and I haven’t yet heard Bernstein’s), atmospheric but also dangerously verging on the languid, memories of a sultry summer day, too hot to move. Pastorale is hugely atmospheric as it is, you don’t need to overdo it. Also, the very close recording pickup and transfer makes everything sound big and close, strings and woodwind + brass solos, robbing the music of some of its atmosphere. 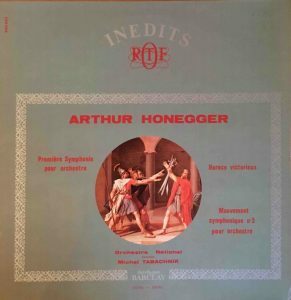 Chant de Joie, from 1923, predating Pacific 231 by a few months, is pleasant but not Honegger’s best inspiration, illustrating his preference for simple if not simplistic A-B-A forms (vigorous and loud / appeased and pastoral / loud and vigorous) and with a touch of naïveté in its thematic inspiration. Paul Sacher, recorded in 1992 by Pan Classics (reissued on Accord), plays it with more refinement than Baudo, and his slightly more animated tempo in the outer sections is also welcome. Honegger wrote “vigorous and rhythmic” but it is better to translate that, as Sacher does, into “gruff Swiss merriment” than “massive and elephantine”, as Baudo tends to do. 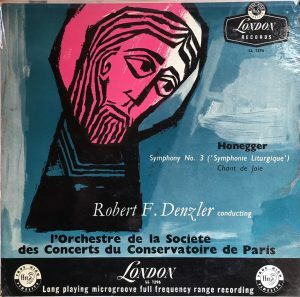 But the only version that truly made sense of the title and filled the music with a true sense of joy (at a more animated tempo) was the old 1955 Robert Denzler with Orchestre de la Société des Concerts du Conservatoire on Decca (paired with a great reading of Symphonie Liturgique): I have the LP, and it had been dubbed to CD by the French label Forgotten Records (sold only on their website, link will open new tab to their catalog), but finally it’s been reissued in state-of-the-art transfers by Decca in 2015 on their mammoth 53-CD set 478 7946, “The Decca Sound – The Mono Years 1944-1956”, barcode 028947879466. So, despite the sonic problems of Symphony No. 1 and the loss of the two early symphonic poems, the Western edition is, as frustrating as it may be, the issue to favor. 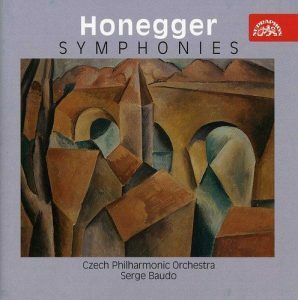 It remains today the best complete cycle of Honegger’s Symphonies. Dutoit is generally fine though generally lacking the touch of bite, rawness, even brutality that the works require, but his Second is a total miss. Plasson offers great No. 1 and 2 (the latter however is the only version I’ve heard that does WITHOUT the “ad libitum” trumpet in the Finale) and a fine “Liturgique“, but his 4th and 5th are deeply flawed. The more recent Fabio Luisi with Orchestre de la Suisse Romande (recorded in 1999), other than the ludicrous price now demanded for it on the marketplace, suffers from the conductor’s uniformly slow tempi everywhere, almost a gimmick. I haven’t heard the recent Roman Brogli-Sacher with the Lübeck Symphony Orchestra on Musicaphon (the individual symphonies were recorded between 2007 and 2010 and have just been regrouped on a 2-CD set). There’s a new cycle underway by Dennis Russell Davies conducting the Basel Symphony Orchestra, on the orchestra’s house label. I’ve heard only the first installment, with Symphonies Nos. 1 & 3, and it was mediocre.